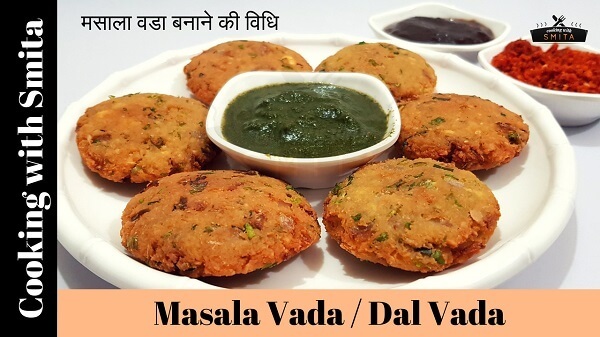 Masala Vada, also known as Dal Vada is a favourite South Indian snack and favourite street food. 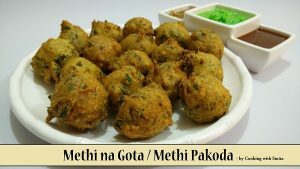 It’s made using coarsely ground & soaked Chana Dal (split Bengal gram) with a mixture of spices. It’s a very delicious, flavourful and crispy snack served with chutney or as a Tea-Time snack. Wash and soak Chana Dal in a reasonable amount of water for 6 hours. Drain thoroughly, there should be no water remaining in dal. Add Chana Dal in grinder jar and coarsely grind with ginger without adding water. Do not make the fine paste. Take coarsely ground Dal in a bowl, add Onion, Green Chillies, Coriander, Curry Leaves and salt and mix well. Prepare small to medium size balls from the mixture, flatten them and place them on a plate. Flatten them slightly thin to make more crisp and crunchy Dal Vadas. If the mixture is not binding well and not holding the shape, you can add rice flour as required at this stage. Heat oil on medium flame in a kadhai. Carefully slid Dal Vadas in oil and deep fry until golden brown and crisp. Place the fried Vadas on a paper towel to get rid of excess oil.